WHOOO! YEAH! Gooooood morning America! Hey, why the sad faces? You look like you're not getting your recommended daily allowance of pure awesome. 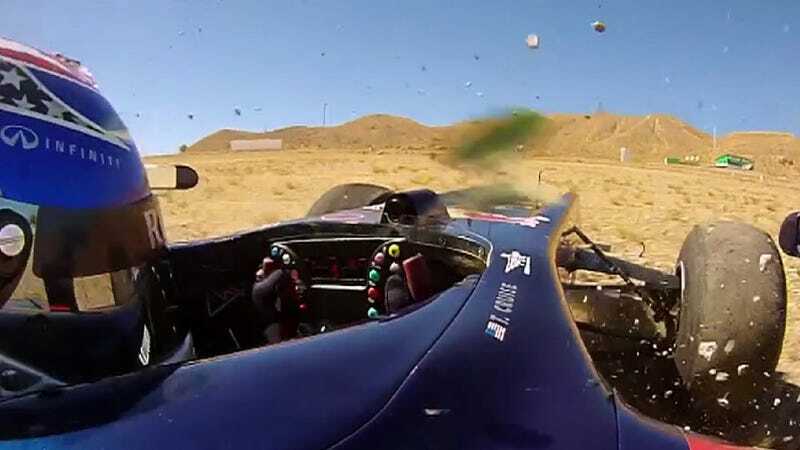 Thank the volcanic aliens that Red Bull and Tom Cruise are here to top you off with America's greatest action hero doing laps in an old Red Bull F1 car on a closed circuit. Come for the hot laps, stay for the helicopter stunts! Tom Cruise's awesomeness is so intense even a F1 car can't contain it, and has to run off the track to relieve some of the intensity of the situation, making Tom Cruise the world's best F1 all-terrain driver. He's even got his name on the side of the car, just like a real F1 driver, which David Coulthard says he could totally become*. Awesome blossom! Tom Cruise is a human can of Red Bull, in that he's full of energy and also a little smaller than other cans. *Actual David Coulthard quote: "I have no doubt that if he really wanted to put some serious time to driving those types of cars, that with a few days of proper running, he could be running some really good times."